The Houston Independent School District has established as one of its primary goals the provision of a high-quality educational program for each student in a safe school environment free of disruptions that interfere with the educational process. 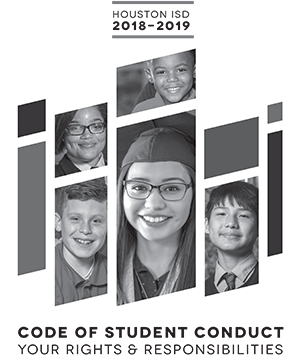 The purpose of this Code of Student Conduct is to inform all school staff, students, and parents of HISD’s expectations regarding behavior and conduct. The Code, reviewed and approved by the HISD Board of Education, is based on the policies of the Board of Education and Administrative Regulations. Administrative Regulations communicates District administrative procedures and practices. School staff, students, and parents are expected to become familiar with the provisions of the districtwide Code of Student Conduct and the rules and regulations adopted and implemented by individual schools based on their School-Based Discipline Management System. Students are also expected to abide by the policies set forth in the Code so that they can get the most out of their years in school. office of your student’s school. Offering substance addiction education, assessment, and, if indicated, community-based treatment alternatives for first-time drug or alcohol offenses as an alternative to a Disciplinary Alternative Education Program (DAEP) referral. Offering summer school, weekend activities, community projects, or summer jobs that will allow students with discretionary offenses to return to their home campus instead of beginning the new school year in the DAEP. Moving most non-statutory Level IV offenses to Level III and identifying them as offenses with an elevated safety risk to the campus. Aligning suspension practices with FO (LOCAL) regarding prohibition of informal suspensions. Rephrasing section titles and descriptions to better align with HISD discipline and educational objectives.